Pinwheels are simple to make with solid colored or brightly patterned paper. Pinwheels are a creative craft for preschoolers, who are just starting to learn and build their artistic and conceptual skills. There is very little preparation involved and the supplies are inexpensive. 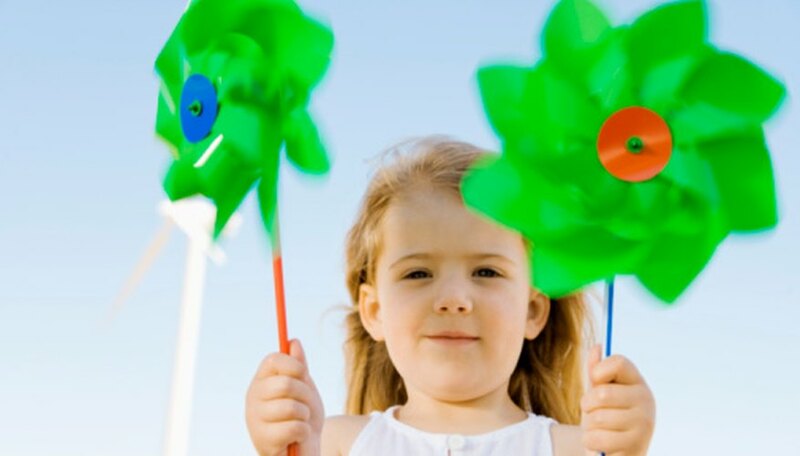 You can use this as an opportunity to teach children about wind, and they can enjoy playing with their pinwheels once they are finishing creating them. To make pinwheels you will need a pencil with an eraser, colored construction paper, a plastic straw, scissors and a paper fastener. You may use a straight pin instead of a paper fastener, but a paper fastener is safer and more appropriate for young children. Provide children with markers or crayons so they can decorate their pinwheels. Print out a pinwheel pattern (see Resources section). Print out on colored paper or print on white paper then allow children to decorate the paper. Children should decorate pinwheels now, before assembly begins. Have each child cut the pinwheel pattern along the exterior solid lines. Demonstrating each step as you go, have the children cut the diagonal dotted lines up to the edge of the circle. Avoid cutting into the circle. Use a sharpened pencil to poke a small hole in each corner of the square pattern. Use the pencil point to poke a hole in a plastic drinking straw about 1/2-inch from the top. Pull in the corners of the pinwheel so the four tiny holes meet at the center circle. Push the paper fastener through the four holes on the pinwheel and through the center circle. Finally, hold the straw against the back of your pinwheel and push the paper fastener through the hole you created in the straw. The paper fastener will stay in place if you push the ends flat in opposite directions. After the class finishes decorating and creating their pinwheels, take the children outside and allow them to experiment with their pinwheels. Demonstrate how the pinwheels start to work with the power of the wind. Tie this into a basic discussion of how we can generate electricity with wind power. Kathryn Stanley is a professional writer for various websites, covering fashion, science, the environment, food and baking, crafts and the arts. She studies psychology and creative writing at the University of Maryland at College Park.